It’s time for some serious rock and roll. The 1970s signature American rock band Grand Funk Railroad is rolling into Lincoln City’s Chinook Winds Casino Resort to bring down the house with their high-energy sound. Known for their bass riffs and pounding percussion grooves, this band delivers on foot-stomping guitar licks, soulful keyboards and tight, clean vocals. 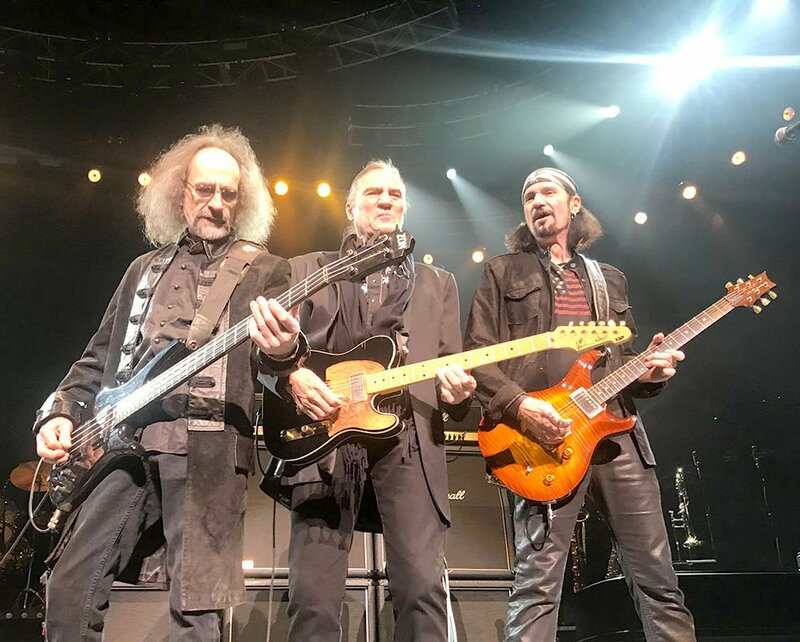 Now marking their 50-year milestone, Grand Funk is touring the US, showcasing their still-popular tunes with exceptionally vital performances. The 2019 American Band Tour includes 40 shows and comes on the heels of the popular 2018 tour, the 2017 reunion tour, and so it goes. Don Brewer, drummer, vocalist-songwriter and an original member of this Flint, Michigan, rock band says that touring in 2019 is a whole lot different from the early ’70s. Brewer and bass guitarist-songwriter Mel Schacher, are the only two founding members who continue to perform as Grand Funk Railroad. The third founding member, guitarist, vocalist-songwriter Mark Farner, has periodically returned to perform in reunion tours, but maintains a solo career. Now joining Brewer and Schacher is vocalist Max Carl, a true rock veteran from 38 Special whose vocal chops made “Second Chance” their biggest hit. Brewer says Max Carl is “the best blue-eyed soul singer on the planet.” Lead guitarist Bruce Kulick is best known for his 12 years with KISS. Keyboardist Tim Cashion has a master’s degree in music and is affectionately called “Dr. Tim” by his bandmates. He has credits performing with Bob Seger and the Silver Bullet Band and England’s soul man, Robert Palmer. Some of the biggest Grand Funk hits include “We’re an American Band,” “Closer to Home,” “Loco Motion” and “Some Kind of Wonderful.” “We’re an American Band” has been featured prominently in movie soundtracks and TV and radio advertising. Grand Funk Railroad was originally patterned after hard rock power trios such as Cream, but gradually developed its own popular style of rock/rhythm and blues/pop. Brewer says their shows draw eclectic audiences of all ages. “We’ll have grandparents, kids and grandkids singing along with our songs,” he said. Brewer has enjoyed a long relationship with Bob Seger since late ’60s. He toured with him beginning in 1983, during a Grand Funk hiatus. He played in the band for Seger’s induction into the Rock and Roll Hall of Fame. They frequently do shows together and he anticipates doing three more in 2019. Today when Brewer isn’t touring, he and his wife are involved in animal rescue, education and animal welfare. This will be Grand Funk Railroad’s second time performing at Chinook Winds Casino Resort. Grand Funk Railroad will take to the stage at 8 pm on Friday, March 29, and Saturday, March 30. Tickets, $40 to $55, are available by calling 1-888-MAIN ACT (1-888-624-6228), in person at the Chinook Winds box office, or online at www.chinookwindscasino.com.